After Tile Restorer is an easy to apply polymer based emulsion for restoring the sheen to dull Natural Stone tile surfaces by providing a restorative coating after cleaning. Specially formulated for use on most common types of porous tiles including travertine, slate, limestone, brick, terrazzo and natural stone. Tile Restorer forms a durable protective seal on the surface of the tiles to provide long term protection against wear and damage from traffic and spills. 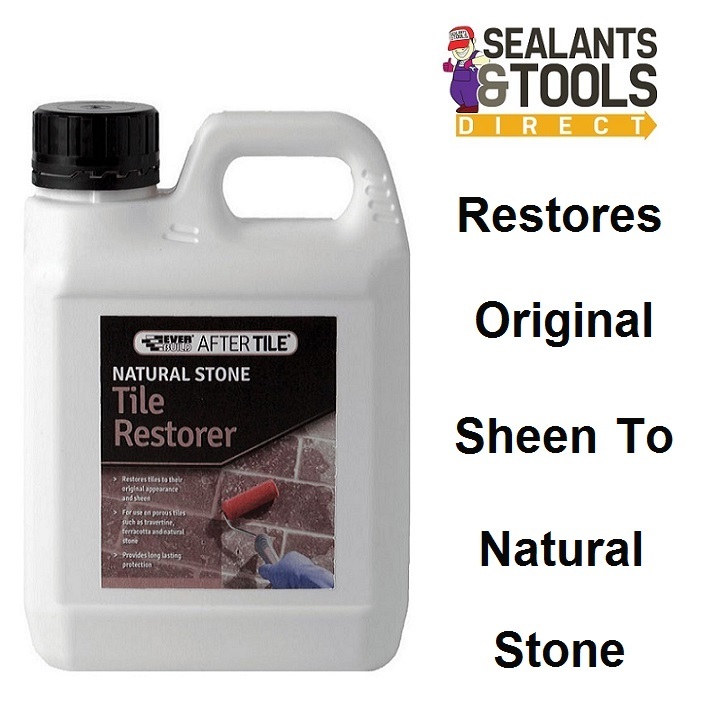 Restores tiles to their original appearance and sheen. For use on porous tiles such as travertine, terracotta and natural stone. Sealing & restoring porous tiles including travertine, slate, limestone, brick, terrazzo and natural stone. Approx. 60 to 80m2 per litre of diluted product this depends on porosity of substrate. Always test a small inconspicuous area prior to full application. Do not use on marble, granite or other polished sealed tiles. Do not apply by brush. Do not use in areas subject to high water contact or constant water immersion i.e. wet rooms, shower cubicles etc. Remove any spills immediately with a clean soft cloth. Tiled surfaces can be slippery when wet.